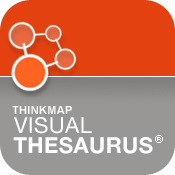 What is the Visual Thesaurus? Say you have a meaning in mind, like “happy.” The VT helps you find related words, from “cheerful” to “euphoric.” The best part is the VT works like your brain, not a paper-bound book. You’ll want to explore just to see what might happen. You’ll discover — and learn — naturally and intuitively. You’ll find the right word, write more descriptively, free associate — and gain a more precise understanding of the English language. Wordnik is the world’s biggest online English dictionary, by number of words. 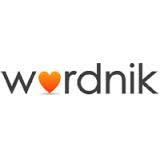 Wordnik is a nonprofit organization, and our mission is to find and share as many words of English as possible with as many people as possible. 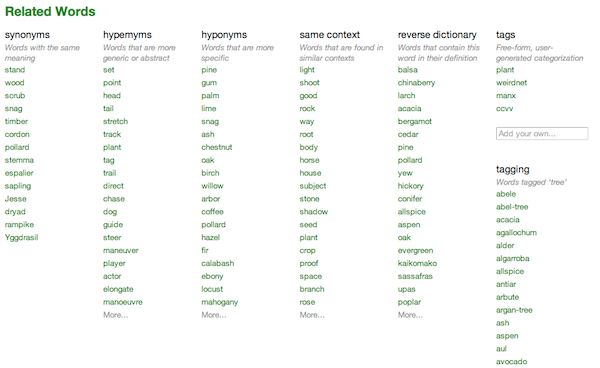 Wordnik shows definitions from multiple sources, so you can see as many different takes on a word’s meaning as possible. What do we mean by “related words”? Our word relationships include synonyms, hypernyms, hyponyms, words used in the same context, a reverse dictionary, and tags. But what does all of that mean? First up are synonyms, or words with the same or similar meaning, for instance, timber and sapling. A free site that allows students at high-elem., junior high and high school levels, teachers and life-long learners to acquire and retain vocabulary. Each free session has three levels: Beginner, Intermediate and Advanced. 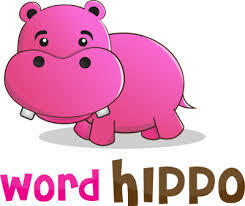 Each level has 3 puzzles with 12 words each (36 total words in a session) and contains seven (7) additional activities/exercises that help develop vocabulary. It is continuously updated. WHAT DOES A ROOT WORD LESSON PLAN PROVIDE? When you learned English, you did not sit down with 1,000 flash cards. Instead, you listened to people talk or read stories and whenever you encountered a word you didn’t recognize, you deduced its meaning based on the context of the sentence. Why should that learning process be any different now? The VocabSushi philosophy believes you can learn the meanings of words faster, more accurately and more efficiently by reading through sentences rather than just trying to memorize definitions. Many words, for example, commonly appear with other words – such as “an egregious error” or “an intrepid reporter” – which can clue the reader in on the word’s appropriate usage as well as its general meaning.